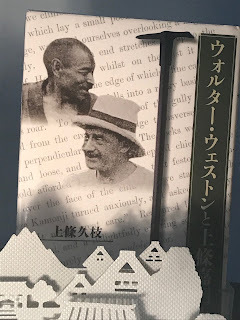 Walter Weston and Kamonji Kamijo Walter Weston is very famous and referred as a father of modern mountaineering in Japan.We can see his relief in Kamikochi, near Taisho pond in memory of his contribution. So here is the question I came up to my mind: what did he do actually?A book titled “Walter Weston and Kamonji Kamijo” by Ms. Hisae Kamijo, a wife of Kamonji’s great-grandson’s tells me the answer. During his stay in Japan, Weston was very enthusiastic for climbing, and has been to a lot of mountains, mainly in North/South Japan Alps, sometimes with his wife. He became the first climber to have reached some summit of Japanese mountains. Before the Weston’s era, mountains had been a place for living or symbol of religion. He brought us an idea to climb mountains as a pleasure. The book also talks about Kamijo, Kamonji, a hunter, and mountain guide who lived in Kamikochi. It’s hard for me to explain who/how he was in English, but I must say he is the key player of “Golden Age” of Kamikochi. Kamonji guided Weston to Hotaka, etc. and built a friendship with Weston. Walter Weston was born in Darby in 1861 and had stayed in Japan three times in 1888-1894, 1902-1905 and 1911-1915 as a missionary. Before/Around when Weston came to Japan, in late nineteenth century, Ernesto Satow, British diplomat, published “A Handbook for Travellers in Central and Northern Japan” and some foreigners started to climb mountains in Japan.